I got a chance to go to a Fathom Events presentation of Little Shop of Horrors, a movie that I loved. However, there was a surprise… it was the Director’s Cut. Frank Oz, director of Little Shop of Horrors, started the afternoon with a question answering session that gave us some background on the filming of the great musical and hinted at what we were about to see. Oz had originally intended the film to be released in this manner, but they went back and added a “happy ending” instead for the wide release. Oz said that this was the first time this original ending, a darker ending- as he put it, was to be seen on a big screen. This made me even more excited to see the film. I knew the original play Little Shop of Horrors ended in a much less happy way and I was anxious to see how different the end would be. Last week I placed Audrey II on my list of Top 10 Movie Monsters, and after seeing the original ending, I believe that placement is well deserved. The chaos and disorder that Audrey II brought to the end of the Director’s Cut was amazing. It was anything but happy ending Seymour and Audrey. Little Shop of Horrors is a great musical with amazing songs. I love “Skid Row,” “Mean Green Mother from Outer Space,” “Feed Me,”among many others. I found myself singing along under my breath through the whole film. It was so much fun that I had a smile on my face the entire time. Rick Moranis and Ellen Greene are perfect as sad sack Seymour and abused Audrey. They bring such wonderful depth to both of these characters that I just can’t imagine anyone else ever filling those roles. Steve Martin appearing as Orin Scrivello, D.D.S. is one of the greatest roles in comedic movie history. Martin and the improvising Bill Murray are hilarious together in the dentist scene. 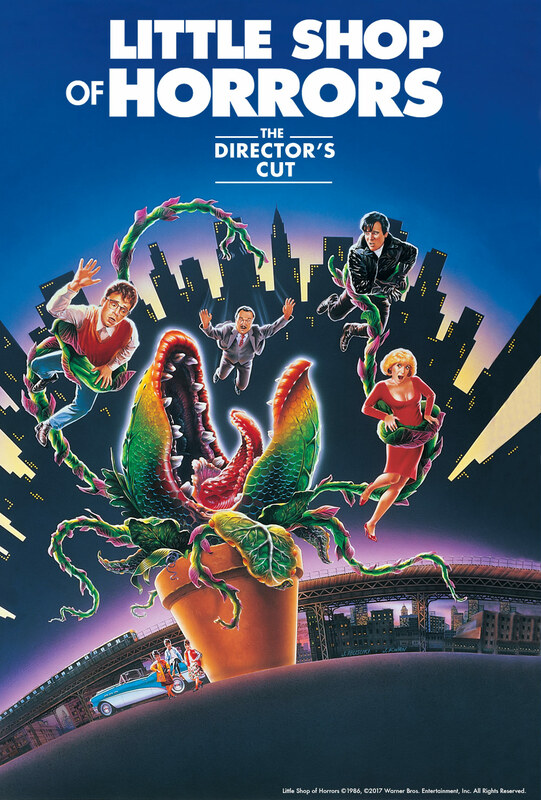 In the new (original) ending, Seymour certainly pays more for his part in creating Audrey II and the deaths of Orin Scrivello and Mr. Mushnik (Vincent Gardenia). Little Shop of Horrors is a great Halloween movie, and this darker version fits even better. I loved this movie before, but I think I like the original ending even more.